The 3-D Disney animated movie Frozen centers around two sisters who live in a winter environment, and the Disney Frozen Castle & Ice Palace Playset does a great job at replicating the different homes where the two heroines live. Several accessories highlighted in the movie are also included for out-of-the-box fun and play time, as is the lovable and fun snowman, Olaf. The Arendelle setting in the film produced by Walt Disney Animation Studios and Walt Disney Pictures delivers the motion picture environment in a portable playset, and deserves a closer look. 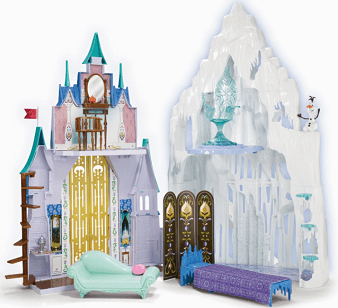 Why is the Disney Frozen Castle & Ice Palace Playset A Smart Purchase? Delivering two worlds in one, the Disney Frozen Castle and Ice Palace Playset re-created from the popular Disney animated film Frozen comes in a large, foldout form. One side for each sister is included, and parents should understand that the dolls themselves are not included. The tall, well made unit snaps close and has a handle at the top, so the playset is portable. The front, back and interior of the castle and palace are effectively recreated. The frozen castle side includes a two-level layout, with a vanity where the lovely redheaded younger sister Anna can get dolled up, including perfume bottle and chair. The Ice Palace includes a snowflake stairway which leads to a chilling throne that appears to be sculpted out of ice. Here the blonde, brooding princess Elsa can look down over her wintry paradise. Great detail throughout. Elsa has a special ability to turn anything she touches into ice in the movie, and her side of the play-kit reflects that. For young girls who are familiar with the Disney film, they will recognize the Olaf snowman character, which is included. Olaf has plenty of places to hide in little cubbyholes, and even gets a frozen snow slide. The animated 3-D musical fantasy film appeals to young princesses-to-be, as will this large 2-sided playset from Disney. Young girls with active imaginations will enjoy reliving favorite scenes from the Disney movie, and creating their own. The Disney Frozen Castle & Ice Palace Playset makes a smart buy for your very own princess who loves the movie Frozen, and both Elsa and Anna dolls are available as optional purchases.